The Gallery of Virtual Topography features virtual depictions of topography, including 3D perspectives and QuickTime Virtual Reality (QTVR) movies, created from Digital Elevation Models (DEM's). The site showcases QTVR object movies where the user can spin a 3D terrain to view it from different perspectives. It also includes static 3D-perspective images (JPEG files) of the 3D terrains for those users with slower Internet connections. Some movies and images depict only the form of the landscape, but in others topographic contours are draped over the landscape to better illustrate the how contours portray different type of topography (cliffs versus badlands, for example). 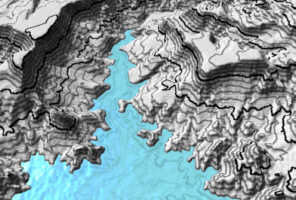 Some animations illustrate the significance of contours, by allowing the user to progressively fill the landscape up with water to and see the water interact with different topographic features. The site also contains a topographic contour map for each 3D terrain, so that instructors can develop student exercises, such as locating points on a map and constructing topographic profiles. Some QTVR movies contain numbered topographic features just for this purpose. Visit the Virtual Topography Information Page to see where we got the data, how we constructed the movies, and who helped fund it. All materials are copyright �2000 by Stephen J. Reynolds and Julia K. Johnson, but can be used freely for educational, noncommercial uses, as long as the source is cited. If you use the site, tell me, because it's a nice thing to do.